Dr Neena has a brilliant academic background, and continues her research pursuits along with her performances and teaching responsibilities. She pursued a rigourous regimen of dance education, achieving proficiency in Bharatanatyam, Kuchipudi, Mohiniyattam and Kathakali. After her MA in English Literature, she was awarded PhD from Rabindra Bharati University, Calcutta, for her thesis on "The concepts of Lasya and Tandava in the classical dances of South India- A detailed Study". She was also awarded a post doctoral Research Fellowship from the AHRB Research Centre for Cross Cultural Music and Dance Performance, University of Surrey. "The concepts of Lasya and Tandava in the classical dances of South India : A detailed Study" is an in-depth examination of the various manifestation of lasya and tandava, the two fundamental and philosophical modes common to all classical dance forms in India. 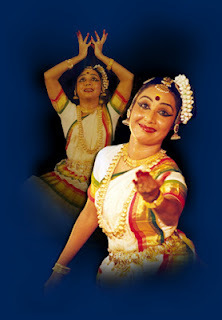 The study explored, how these twin concepts are aesthetically differentiated and synthesized in the South Indian dance such as Bharatanatyam, Mohiniyattam, Kuchipudi and Kathakali. The work looks at the concepts from the classical canons of Indian aesthetics beginning from Bharatha and other leading exponents of the Sound theory of the nine sentiments, or the Doctrine of Rasa. Dr Neena was awarded a Research Fellowship from the AHRB Research Centre for Cross Cultural Music and Dance Performance, University of Surrey. UK. She worked on the theme: Post Colonial Identity Construction: The study explores the evolution of the protagonist, or ‘Nayika’ from the colonial period, to its present form in the post colonial context.